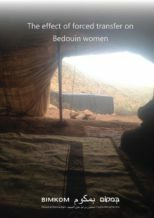 Many Bedouin communities in Area C of the West Bank today are threatened with eviction and forced displacement from the areas they live in, and this forced transfer threatens to bring disaster upon them and deteriorate their already precarious situation. This position paper discusses the effects of the forced transfer on Bedouin women and girls who have been removed by Israel from their natural habitat, and on whom a new spatial and social reality has been imposed in recent decades. This entry was posted in Area C, Publications, Publications. Bookmark the permalink.